GIVEAWAY ~ AWAKENING SKIN CARE Mega-Giveaway! Beginning today and lasting through December 26, 2008 - Champagne Living and Awakening Mineral Moisture Therapies for Healthy Skin are giving you the opportunity to win some of the FINEST skin care products available. Each week for the next FIVE weeks 2 winners will win a PRODUCT OF THEIR CHOICE from the AWAKENING SKIN CARE catalog. Every Friday I will announce the ways that you can get entries into this GREAT GIVEAWAY. Each week will be totally different (just for fun). BUT THERE'S MORE ~~~~ on the FINAL DAY of the Giveaway (12/26/08) I will also be picking a winner of the GRAND PRIZE DRAWING of a FULL ENSEMBLE of AWAKENING'S products (with the exception of MUDFACE which is currently being reformulated). * Awakening HANDS in both the FULL size as well as the TRAVEL size. If you haven't tried AWAKENING SKIN CARE, you're in for a BIG TREAT. Please read the review I wrote after using the samples that they sent me HERE. You know, mineral cosmetics are a red hot topic these days, but they're only HALF of the equation. Awakenings brings to the table the cutting edge of natural mineral skin care. to hydrate & heal. This is SERIOUS SKIN CARE! * Unique Mineral-Moisture therapy creams treat dry, cracked and irritated skin. * Concentrated Dead Sea minerals moisturize and heal. * Rapidly absorb, non-greasy, not sticky. * Natural aromas of essential oils and botanical extracts. * NO PARABENS: No mineral oils. No animal by-products. Never tested on animals. If you can't WAIT for the drawings, you can order AWAKENING SKIN CARE products online, or search on the "Store Locator" on their site for a store near you. You can also order samples of their products online as well. * Go to AWAKENING SKIN CARE and choose WHICH ITEM you'd like to win if you are chosen as the winner. * COMMENT - with the item you've chosen - include your e-mail address in the comment. * DAILY ENTRY - You may choose the same product or a different product with each entry, it's totally up to you. * PLUS - For EACH place that you list this GIVEAWAY you will get another 5 entries. Monday, December 1, 2008 and notified via e-mail. Winner has 72 hours to respond to winning e-mail, or an alternative winner will be chosen. I checked the store locator and found their products sell at a store in my town, so I may have to do some early Christmas shopping. The ingredients in the hand cream include ginger, cinnamon and myrrh, which should smell fantastic, too. Many, many thanks for doing the giveaway. FACE&NECK Mineral Anti Wrinkle Cream - I saw this product first thing and had to laugh - this is what I really need to win! The foot cream is what I need. FACE&NECK Mineral Anti Wrinkle Cream -- would love to try! FACE & NECK Mineral Anti Wrinkle Cream sounds like what I need. Would love the Face and Neck Mineral Anti-Wrinkle Cream ~ great products! I'd really like to try the "FACE&NECK" thanks! I would love to try the FACE & NECK Mineral Anti-Wrinkle Cream. I'd love to try the "FACE & NECK Mineral Anti Wrinkle Cream," this sounds wonderful, I need something to erase those little crows feet! Either that, or I need to stop smiling! FACE&NECK Mineral Anti Wrinkle Cream is what I need being over 40! I would like to try the Foot Cream--on my mother. She has "The Heels of Hell!" Anything that was soften those bad boys up would have a customer for life,lol. I really hope I win--I'll be back for more entries! What a great giveaway. Since my worst problem is the skin on my hands, I'd really love to try the Mineral Hand Cream. Thanks so much for this giveaway. I need the Face and Neck Anti Wrinkle Cream......!!! I would love the Mud Face. I would like to try the Face and Neck Anti Wrinkle Cream. Mineral Hand Cream would be what I would love to try. I'd love to try Mineral Hand Cream. and the Foot Cream, I need all over help! Awakening has a Great website, very easy to navigate! My wife loves the Mineral Hand Cream. I would be interested in the foot cream for my wife. The Scalp Masque sounds soooo tempting...like that trip to the salon that I keep promising myself, and never actually making... It has lavender, lemon, and rosemary extracts, plus thyme oil. My old face needs Face & Neck Mineral Anti Wrinkle Cream. I need the mineral anti wrinkle cream to keep those wrinkles at bay. Dead Sea Mineral Body Cream sounds wonderful to me! Another day another entry! I would have to say the Face and Neck cream is what I'd pick! I'm going for the mud face. I posted a little blog on my Livejournal about this give-away, also! I'm really going for the gold! I'd like to try the Face and Neck Mineral Anti Wrinkle Cream. Face and Neck Anti Wrinkle Cream looks great. After the year I had, I really need this! definitely the Face & Neck Cream! I'd like the FACE & NECK Mineral Anti Wrinkle Cream if I win. Thanks! I'd like to try either the Mudface or the FACE& NECK Mineral Anti Wrinkle Cream. I would like to try the FACE&NECK Mineral Anti Wrinkle Cream. I'd love to try the Face & Neck Mineral Anti-Wrinkle Cream. I'd like to try the FACE&NECK Mineral Anti Wrinkle Cream. I need it! The Mineral Hand Cream sounds amazing, too! I'd like to try the "FACE&NECK Mineral Anti Wrinkle Cream". Thanks! I would love to try the dead sea mineral body creme! I would love to see what the Scalp Masque could do for me! Thanks again for the give away! I like the Dead Sea Mineral Body Cream....would love to try that. Dead Sea Mineral Skin Cream! Thanks for entering me. The dead sea mineral body cream is something I found to be most interesting...please count me in for your wonderful giveaway!!!!! Thanks for posting about your giveaway at blogfully dot net!!! I appreciate it! I'm always out when it's sunny and I tend to get sunburned so I think I'd love to try the Awakening Dead Sea Mineral Cream! Gotta love Canadian winters. I would love any of the moisturisers. I would like to try the Awakening Dead Sea Mineral Cream. Sounds wonderful! I would like to try the Face & Neck Mineral Anti-Wrinkle Cream. Thanks for entering me. Another entry today! Still looking forward to the Face and Neck Cream! Face and Neck Anti Wrinkle Cream. I'd love to try the Dead Sea Mineral Body Cream. Thank you! It's currently out of stock, but I'd love to try the MUDFACE Dead Sea Mud Mask. I would love to try the dead sea hand cream for my eczema. Its been driving me nuts since I move back east and nothing works! I would love to try the Face and Neck Mineral Anti Wrinkle Cream. It looks amazing!! Thanks! Mineral hand cream as my hands look like crap! The foot cream would be wonderful. Thank you! I'd love to try the "FACE&NECK Mineral Anti Wrinkle Cream" Thanks! Dead Sea Mineral Body Cream looks aweseom! I am all about dead sea I think it is wonderful! These products look lush. I would like to try FACE&NECK. Thanks for the chance to win! I would love to try Mudface. I have very oily skin, so I think the Mudface would be my favorite product. However, since it's currently unavailable, the Face and Neck cream sounds like just what this 40+ skin needs! The Mineral Hand Cream sounds good to me today--I've got icky dry skin from this crazy windy weather! The Mineral Hand Cream. I always need a good hand cream, what dame doesn't? I also like the Dead Sea Mineral Skin Cream, because it says it is ideal for skin that's been overexposed to the elements. Also has a UV protection factor, which is important any time of year. I'd love to try the Dead Sea Mineral Body Cream, it sounds like what I need. Thank you! Face and Neck Mineral Anti Wrinkle Cream. Thank you for the chance to win. I would love the body awakening and massage because I am under so much stress with being laid off work since the first week of June. Face & Neck Mineral Anti-Wrinkle Cream!! The dead sea body mineral cream. sounds like heaven!!! thanks so much for the chance! I really want to try the Dead Sea Mineral Body Cream. Thank you and Happy Thanksgiving! I'd really like to try the "Awakening FACE&NECK" Thanks! I would love to try Awakening for my dry skin. Face and Neck Cream, please! :) Pulling out a lucky rabbit's foot! I would really like to win the Body & Massage. I am under a lot of stress. I have been laid off work since the first week of June and I am self supporting. My savings is gone and my unemployment is running out. I also have started college online at age 42 and it is pretty tough. I am a recovering alcoholic and I quit smoking two weeks ago after smoking for over 20 years. Please choose me. Thanks. I've never even heard of a Scalp Masque--I'd like to try it! I want to try the Dead Sea Mineral Body Cream. Thank you! I would like to try the face & neck cream! I'd like to try the "Awakening FACE&NECK" Thanks! Mineral Hand Cream today, thank you very much! I think I like the mud! I like the Dead Sea Mineral Body Cream'. I would really love to win the Awakening Body & Massage. I have been under a lot of stress lately and this would be wonderful. I have been laid off work for over 6 months. I am taking college courses at age 42 and feel that I am in over my head. I could use Awakening BODY&MASSAGE right now, I'm super sore!! I really would like to try Dead Sea Mineral Body Cream. I would love to try Awakening FACE&NECK. Thank you. Awakening FACE&NECK. Always concerned about face and neck. 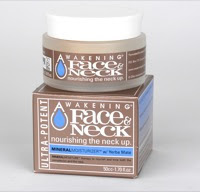 The Awakening FACE & NECK Mineral Anti Wrinkle Cream sounds wonderful! I am always looking for healthy products to hydrate my skin and this one sounds amazing! Thank you for the opportunity to enter. The Awakening FACE & NECK Mineral Anti Wrinkle Cream. since they don't have a product called total wrinkle eraser I would like the face and neck mineral Anti Wrinkle Cream. Thanks a bunch! The Mineral face and neck cream. I totally need this. I was given a tip a long time ago. Always moisterize your neck and chest, including the back of your neck, when you do your face. I have held on to that tip forever. I would like to win the FACE & NECK Mineral Anti Wrinkle Cream. I'd really like to try the "Awakening FACE&NECK"
I'd love to try the Dead Sea Mineral Body Cream. Dead Sea Mineral Body Cream. mineral hand cream if you please! The FACE&NECK Mineral Anti Wrinkle Cream sounds good to me. I'd definitely like to try the Face & Neck Mineral Anti-Wrinkle Cream. FACE&NECK Mineral Anti Wrinkle Cream. Please, it's an emergency.Thanks! face and neck antiwrinkle cream. I would love to try the FACE & NECK Mineral Anti Wrinkle Cream. Thank you and Happy Holidays to you! I would like the foot cream. Well really, I would like to try almost everything there, but for just one, I would try FACE&NECK Mineral Anti Wrinkle Cream. Face &Neck Mineral Anti Wrinkle Cream. I'd love to try the Dead Sea Mineral Body Cream; it sounds so nice. Thank you and Happy Holidays to you! Awakening BODY & MASSAGE sounds like something I would try. FACE&NECK Mineral Anti Wrinkle Cream is something I could use! Thanks! I would like to try the foot cream. Awakening HANDS in both the FULL size as well as the TRAVEL size would be my first choice. I'd like to try the TSA Airline Travel Kit. I would like the Dead Sea Mineral Body Cream. Thanks. The Dead Sea Mineral Skin Cream sounds wonderful!! I would choose the Dead Sea Mineral Body Cream !!!! FACE&NECK Mineral Anti Wrinkle Cream. Thank you! Dead Sea Mineral Body Cream sounds wonderful to me!! Thanks for this awesome giveaway! Should I win I would love to try out the MUDFACE Dead Sea Mud Mask! the Dead Sea Mineral Skin Cream sounds sooo awesome! The scalp treatment looks fantastic! These products all sound very effective, but I'd most like to try the FACE&NECK Mineral Anti Wrinkle Cream. I would like the FACE&NECK Mineral Anti Wrinkle Cream. Unfortunately, I NEED that. I want, no I need,the Face & Neck Mineral Anti Wrinkle Cream. Great contest and great products. I would love to try the Dead Sea Mineral Body Cream. Thank you! I'd love to try the Face and Neck Anti Wrinkle cream - I NEED that!! The Face and Neck Anti-Wrinkle Cream would be my choice!